In the continued battle between Lyft and Uber, both ride-sharing companies are trying to one-up one another with features, promotions and benefits. Anything that makes their service stand out and bring more value to their respective services. I recently noticed that Lyft introduced a new twist to their carpooling service Lyft Line. During a trip that took me to San Francisco and Los Angeles then back home to New York, I used Lyft Line dozens of times. Several times I pulled up the app to request a driver, I was given the option of a “1 min match” or a “10 min match” with the longer match option costing approximately 35% less than the “1 min wait”. Presumably, the longer wait allows the Lyft algorithm to identify another Lyft Line rider that is headed in the same direction. This is a win-win for Lyft and Lyft users. 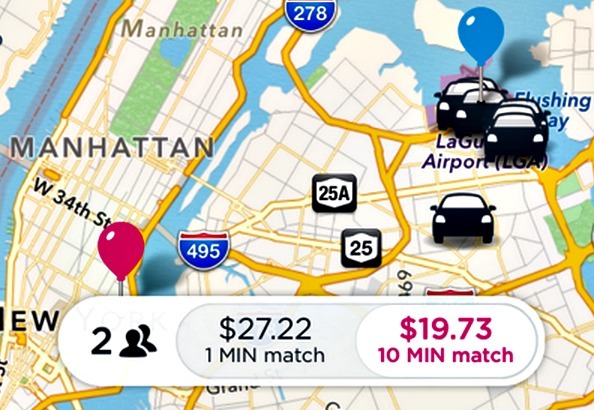 With the 10-minute match, Lyft users get a fare that’s a third cheaper. And with nine more minutes to find a match, Lyft is betting that their algorithm can locate another Lyft user headed in the same direction. Even at a lower fare, Lyft wins because a Lyft Line user only pays for their half of the fare whether there’s one passenger or seventy. Not wanting to lose users or drivers to Uber, Lyft has been covering the other half of the fare for Lyft Line rides with just one passenger. In scenarios where you have *even more* time to spare, the 10 minute match is an awesome value. For example, I took a Lyft Line today from Laguardia to the East Village that cost $19 — that’s an unbelievable 60% cheaper fare than my favorite (and cheap) Chinatown car service. My Chinatown cer service will charge anywhere between $38-45 from LGA to East Village. Lyft Line was already a cheap alternative — saving you 40-60% off a normal Lyft fare, but with the introduction of the 10 minute match, you have the opportunity to save another 25-40%. It just takes a little extra preparation (requesting a Lyft 10-15 minutes before you leave).